This bison, with the arrowheads in the bones, was unearthed in 1924 on the banks of Lone Wolf Creek about 2 blocks from the museum. This discovery predates other arrowhead finds and verifies man’s existence alongside these huge animals. This is truly a one of a kind exhibit! The Columbian Mammoth roamed the area around Colorado City. Mammoth bones have been found at various locations south of the city. The Lake Champion Mammoths were found in 2001 about 8 miles south of town at Lake Champion. The exhibit is displayed in such a way that the visitor can see the sheer size of the animal up close. Chief Lone Wolf was a well-known chief of the Kiowa tribe. The Kiowa and Comanche tribes were quite familiar with the area around Colorado City. This exhibit includes a brief video that explains the history of Chief Lone Wolf and how he was associated with Mitchell County. The Heritage House was the first brick home built in Colorado City. It was built with bricks made from the nearby Colorado River in 1884. In the late 1970’s and early 1980’s, it was restored and given to the city of Colorado City. It is available for small events and tours through the museum. Other exhibits include an arrowhead collection, a mural depicting the history of Mitchell County, a military exhibit, an antique toy collection, a horse-drawn surrey, a T and P caboose, and much more! 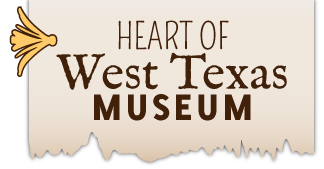 Stop by and visit us to see what more the Heart of West Texas Museum has to offer! We would love to see you!